SOCHI, May 22. /TASS/. 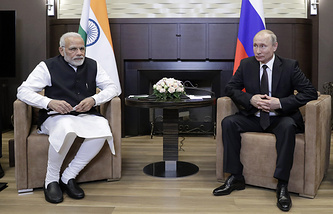 Russian President Vladimir Putin and Indian Prime Minister Narendra Modi covered military and technical cooperation during their talks on May 21, Kremlin Spokesman Dmitry Peskov told journalists. "The agenda of yesterday’s negotiations included the topic of military and technical cooperation," he said, refusing to answer a follow-up question on whether Putin and Modi had discussed the delivery of S-400 missile systems to India. On Monday, Russian Foreign Minister Sergey Lavrov stated that Putin and Modi put particular emphasis on economic cooperation, adding that the parties "touched upon the entire spectrum of the privileged strategic partnership". Lavrov also noted that the energy sector was another key area that was focused on. According to the Russian top diplomat, other topics included high-tech and nuclear energy.